By fans, for fans: Backstreets magazine has been covering the music of Bruce Springsteen and Jersey Shore artists for more than 30 years. At Backstreets.com, the online home of Backstreets Magazine, you'll find regular updates with the latest Springsteen news to keep you up to date between issues  recording activities, performances, setlists, and more. Backstreets is the world's largest community of Springsteen fans but is not directly affiliated with Bruce Springsteen. For Springsteen's official website, visit brucespringsteen.net. For more information on Backstreets Magazine, including new issue updates, online articles, and back issues. Backstreets has covered Springsteen's recordings and performances more extensively than any other publication in the world since 1980 and received a Music Journalism Award for Best Fanzine. BTX was originally set up as a trading post for fans to help each other with tickets, and has since expanded to become a community gathering place. BTX now consists of six forums: three ticket forums; "The Promised Land" for Bruce talk; "The Vineyard" for non-profit music sharing; and "Loose Ends" for everything else. 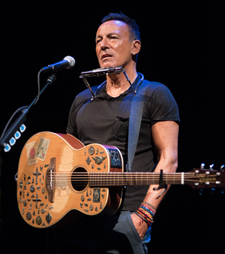 Check out our online Shop of official and authorized Bruce Springsteen merchandise: tour t-shirts, books, magazines, posters, and imported CDs and records. The world's best selection of Springsteen collectibles, all available by mail.